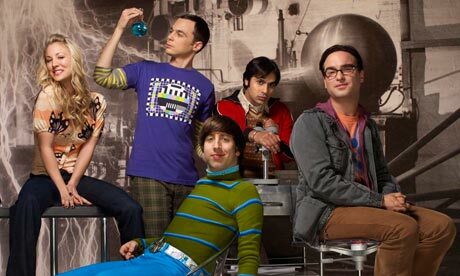 Where have I been the last four series of The Big Bang Theory? But no matter. We are catching up now and laughing our socks off. It’s been a long time since we watched a sit com that was so funny. And it was all thanks to an article Gav read in the paper about the increase of physics students, which the newspaper put down to both The Big Bang Theory and Prof Brian Cox and his BBC documentaries. Amazing, no? Ah, Edward. You are back in my life once more. I rambled on about this subject before and in the blink of an eye it’s here. I went to see the film on opening night with my older niece who is just as crazy about the books and movies as I am and last night I went again with my BFF. She’s not a crazy about the saga but she liked the film too so that was good. And I resisted crying the second time round so that was good as well. Only another year to wait for part two…….. Why oh why did they split them up? 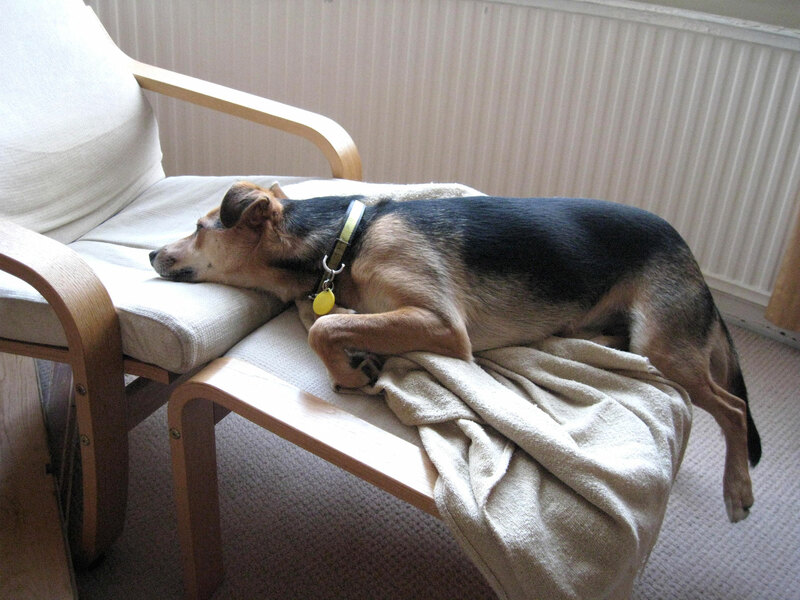 A cute, if I say so myself, little cup holder. Inspired by this one. 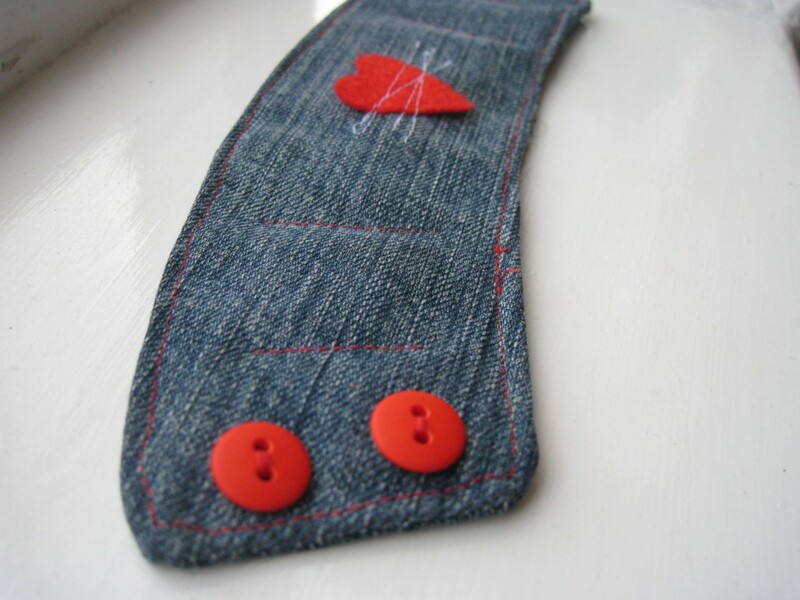 I made it using an pair of old jeans which I admit to hoarding hoping for just this sort of project. So I am doubly pleased with this little make. I used a Starbucks holder to make a template and then cut two pieces of the jeans fabric and two slightly smaller pieces of felt. 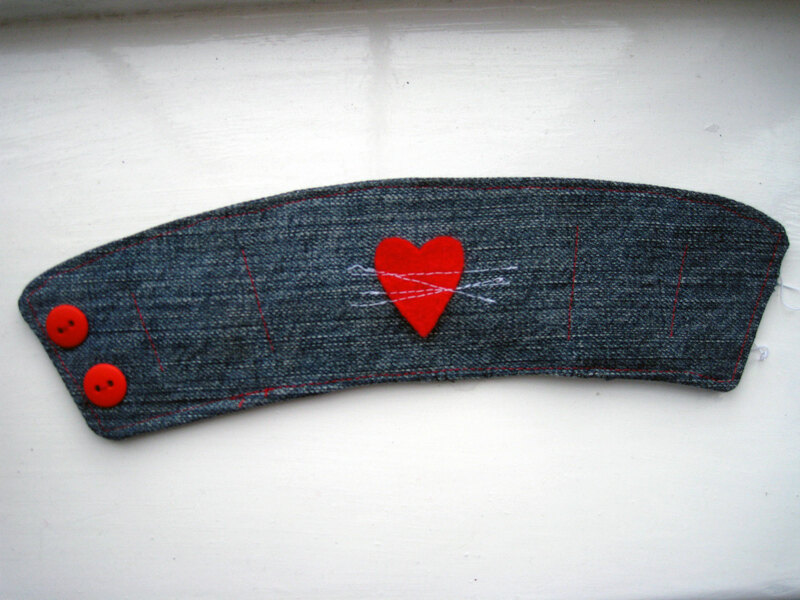 I stitched the red heart on the front of one piece of the jeans and then stitched the two bits of jeans fabric right sides together leaving a gap at the bottom to turn the piece right way round. 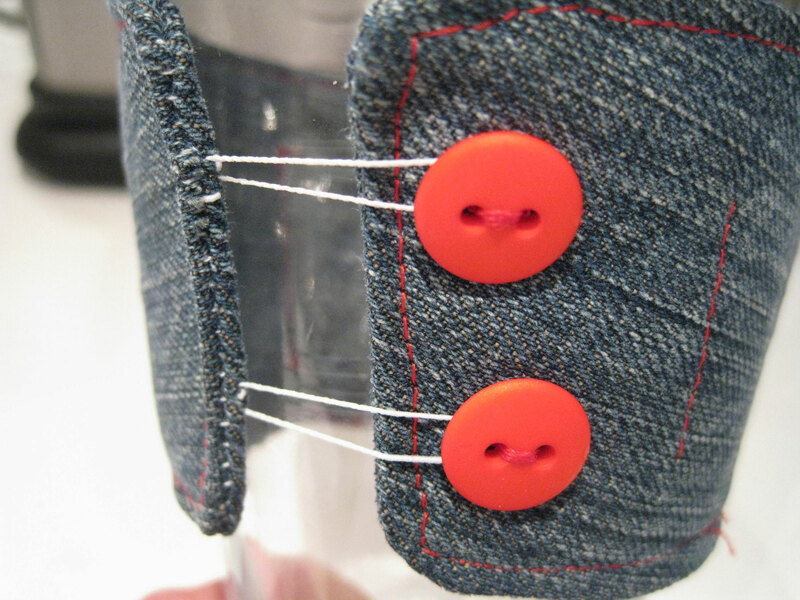 Before I stitched them I attached two loops of elastic which form the button fasteners. When the holder was right sides out – which can be a struggle to achieve but themore carefully you do it the easier it is -I fed the felt into the cavity manoeuvring it to get it to lie flat. I then sewed the gap up by hand. Finally sewing around the edges and attaching two buttons. I thought that it might twist a bit too much after some use so I went back the machine and sewed the four vertical lines which added to the padded effect and made the whole piece feel much sturdier. I find sewing in straight lines a challenge and finishing off sewing projects even more of a challenge but I tried to get it looking neat with no loose ends to eventually unravel. I think a Gingerbread Latte is in order to test that it works properly. The season is upon us. Buying ridiculous amounts of Christmas presents for family and friends. Gav, who turns into a real Scrooge at this time of year, asked me the other day why we do it. He meant all of us out there not just me. And I told him what I’ll tell you. I think it’s partly peer pressure. 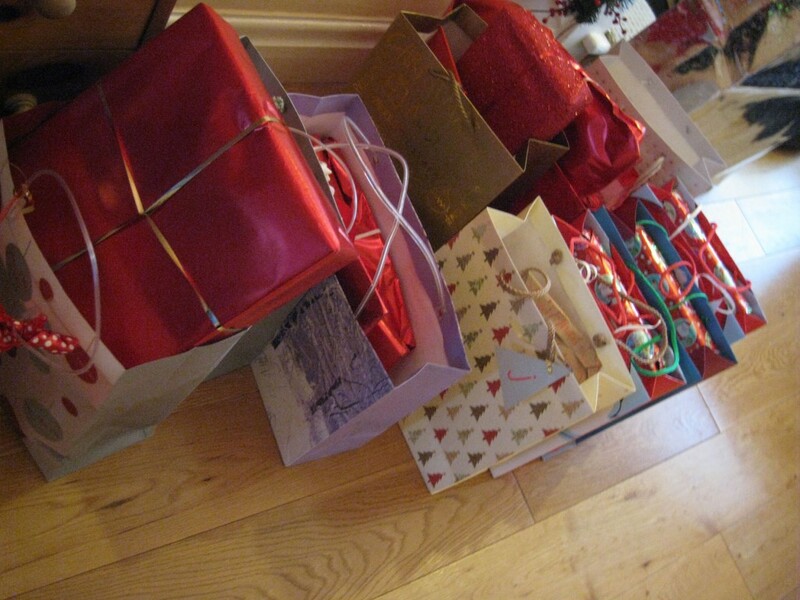 My family have always bought lots of presents, pretty carrier bags full in fact. I remember getting a sack full to overflowing of gifts when I was a kid and we carried on the tradition when my sisters children came along. I think where we went wrong was not cutting the grown ups back to one gift each. And so the madness continues. My sister is the most fantastic gift buyer ever. She has the knack, how I don’t know, she must have been born with it. But rest assured she will have found you that amazing little item you’d forgotten you needed or the one you mentioned 8 months previously. I’ll never reach those heady heights but I strive to. So that’s another reason for the overkill gift buying nonsense. A few years ago when I was feeling particularly guilty about those less well off than myself I declared that all I wanted for Christmas were things from the Oxfam unwrapped list. And indeed I did get several great things bought like school dinners for 20 children and part of a well. But I also got the same amount of regular presents too! Hello…….. family, you missed the point. So I didn’t try that one again. As far as inspiration goes I’m happy to spend hours looking at pretty pictures on Pintrest and I am going to make some presents this year. I am also loving here and here and here. And of course my absolute favourite pottery. Who doesn’t need another mug? But on the whole it’s the usual surf over to Amazon and trips to shopping centres at 9pm to try and avoid the crowds. One day maybe we will learn to control our consumerism – a girl can wish. I was inspired, as ever, by the wonderful post Ali’s put together last week. So pulled my December Daily books out for 2008, 2009 and 2010 and looked through them again. I had already poured over them in preparation for the foundation pages of this years album but I looked at them now with the view as to what stories or concepts I liked, things that I would want in this years albums or ideas to spark a story to capture. Looking back made me ask myself why I choose to do this in the first place. Why do I want to record these 25 days? What do I want the albums to say about me? About the life we are leading right now? I do it because it’s fun. 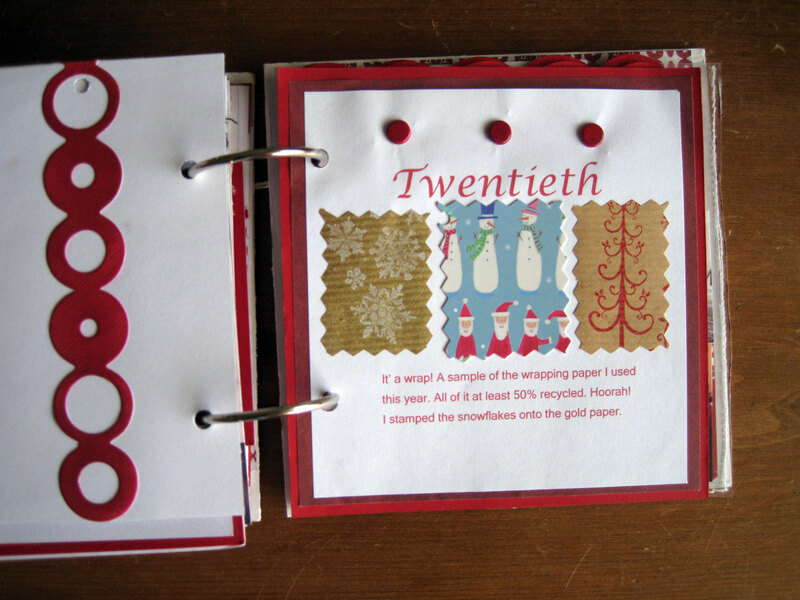 I can’t wait for an excuse to pull out red and white supplies ( I always seem to want red and white at Christmas time) and make cute little pages filled with photographs and words. It’s that simple. As an bonus I’d like family and friends to love looking through them too in years to come and for the memories relived through the pages to be good ones. But first and foremost I do it for me because I like the idea of it, the focus it gives me through the month and the end result. So as I read Ali’s post I jotted down sparks she gave me which I can apply to my process this year. 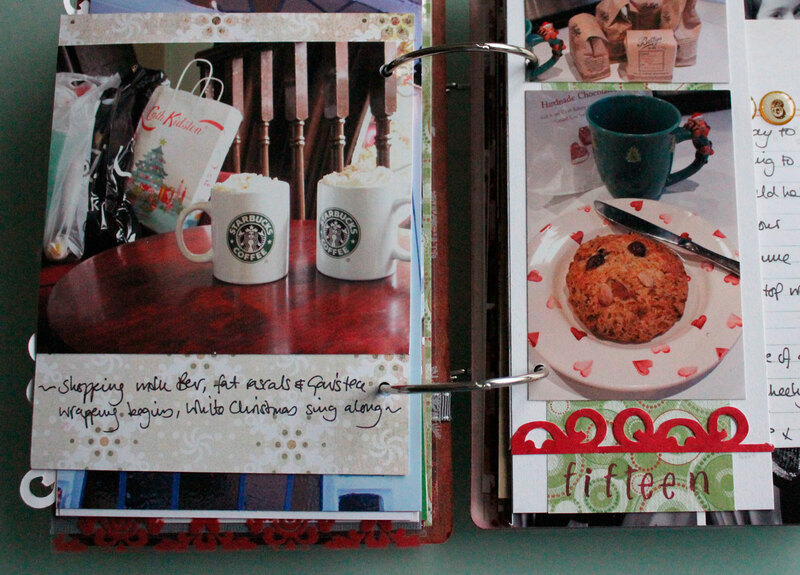 One of my favourite things to look at in hers and other peoples December Daily’s are full page pictures. There have only been a couple of these in my books and only in last years. 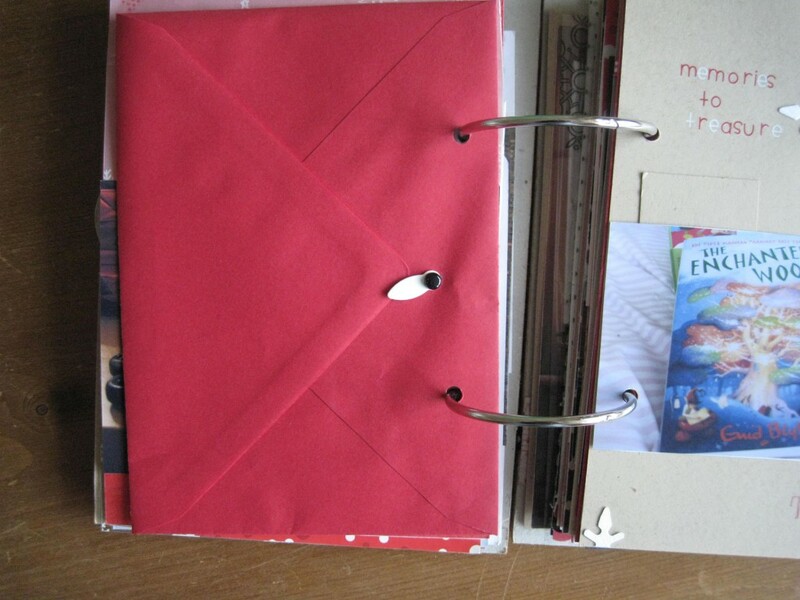 I think I am hung up on keeping sight of the pages to come in the album. 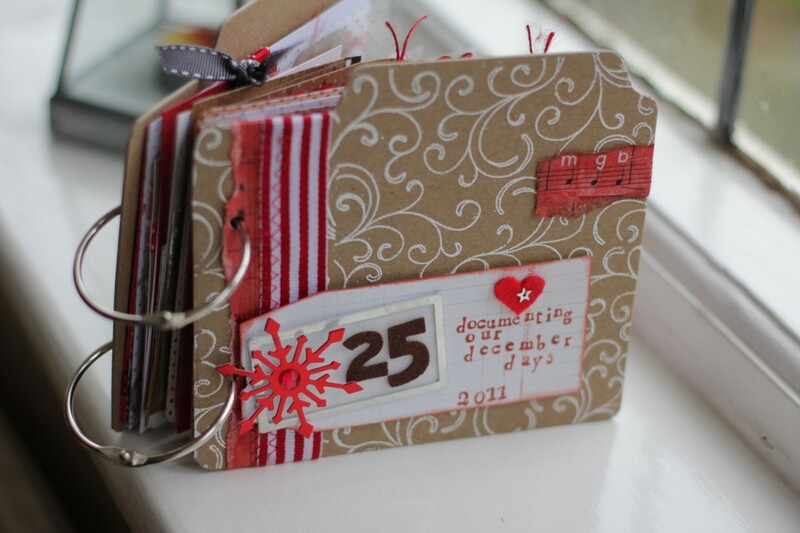 I adore the jumbled up page sizes but by keeping true to this throughout the month means I can’t have full page photos. This needs to be balanced somehow so I get the best of both looks this year. I have never done this but will be trying it this year. One reason is that I like the concept of discovering what’s there when you open out a page. And as my album is small this will give me a space to have a larger picture. On the size front a couple of the comments on my foundation pages post asked how I cope with such a small album. My reasoning behind it is that first I don’t have lots and lots to say. It’s only Gav, Buddy and me so filling a 8 x 6 page fills me with dread. Also I like the easy handling of a small book. Like Ali I put my December Daily albums out on display and I want them to be easy for guests to flip through. 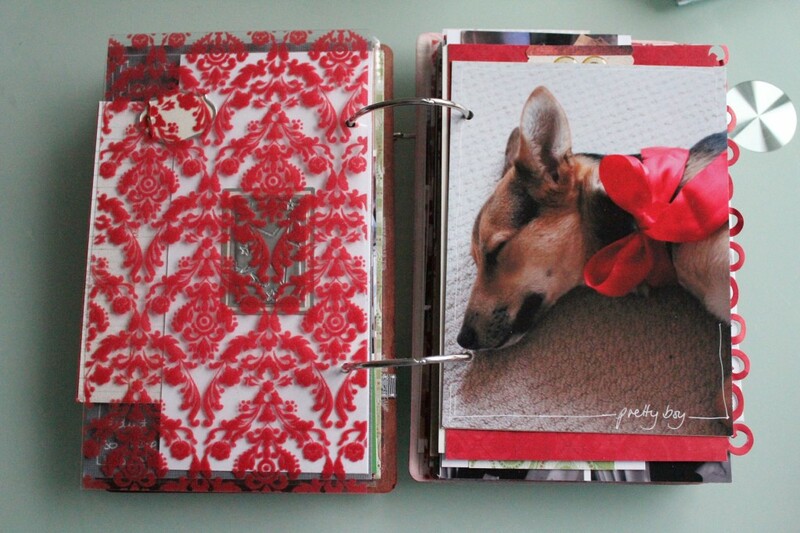 I was tempted to go bigger this year but couldn’t resist the cuteness of my album in 2009 which was 6 x 6. So I cut the chipboard for this years cover and accidentally made it a bit smaller than intended but I wasn’t going to waste the covers so I went with it. 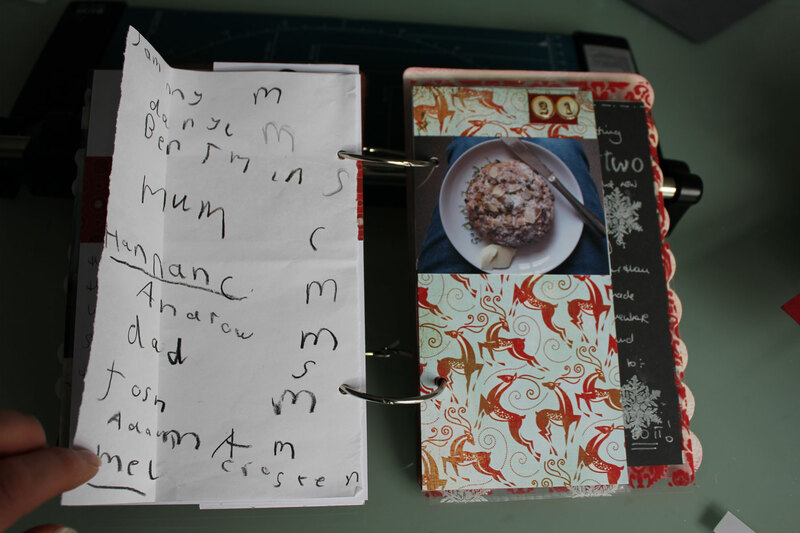 But by utilising the fold out or flip up page I can still have a larger canvas to work with on those days where there is more to say. So it’s the best of both worlds. 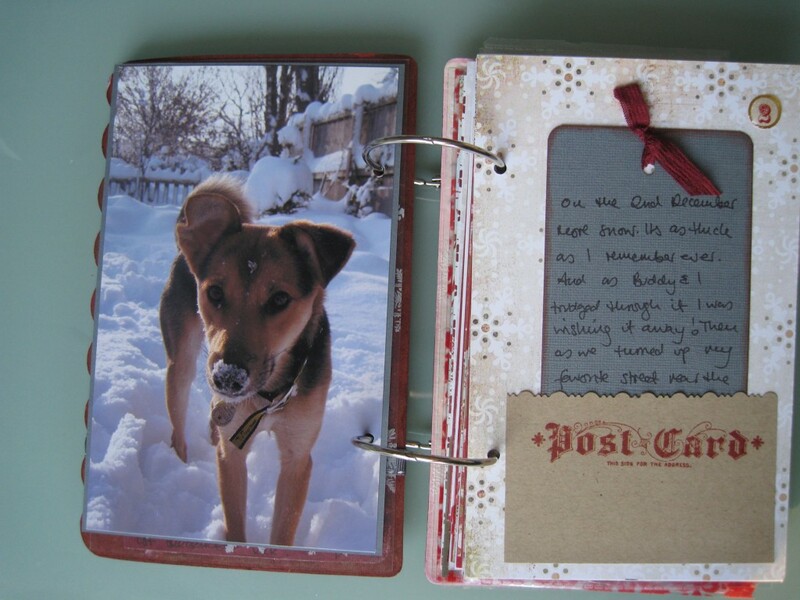 I’ve never written a letter to Santa and put it in my albums so I’m definately going to try that this year too. 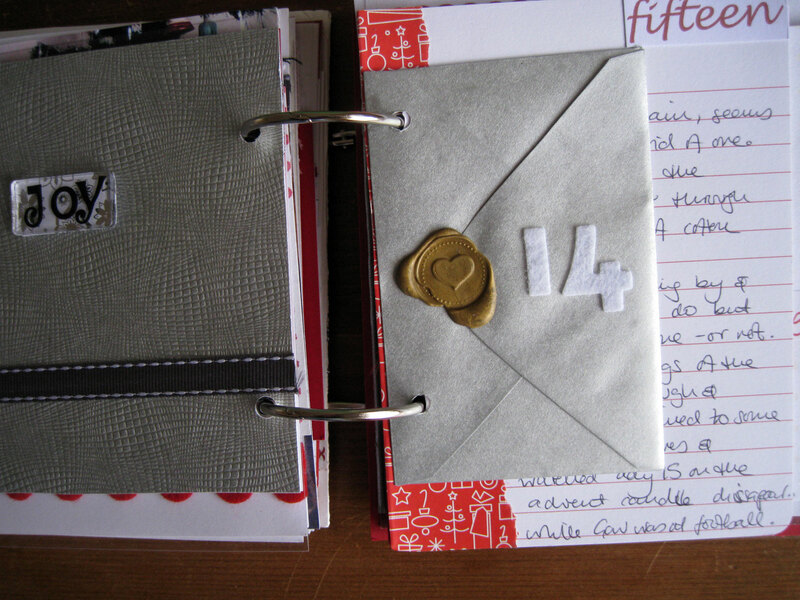 I have written thoughts and sealed them up. Bu I think this year it will be a letter to Santa. Ali’s comments about the entries not having to be holiday related is a great and so true. It’s only the three of us here day to day and to be honest I struggle to find something to write on each of the 25 days. Throughout December we all probably do more stuff than in other months so naturally there will be more stories to tell but every day is not full of holiday cheer. 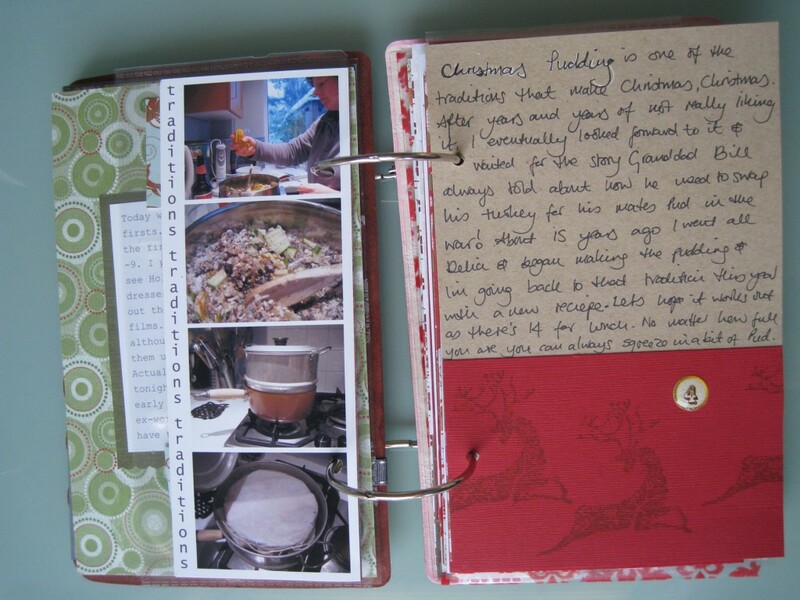 It’s good to remember life is still going on around the joy and festive world out there and what better way to remember that than to add stories of everyday December into the album. Must remember to add more of the ephemera from everyday too. Things from the post and labels and tags etc. The hope of making new memories warms my heart. I have made new memories and traditions through doing these albums already. Decorating my Mums tree and watching Christmas movies with my niece. Here to hoping more will come this year. Taking pictures of our Christmas decorations around the house. The process itself inspires me to decorate more and more and do new things, like the wreath I decorated last year. I’ll be doing a wreath again I hope from scratch and will show it as part of the six projects. 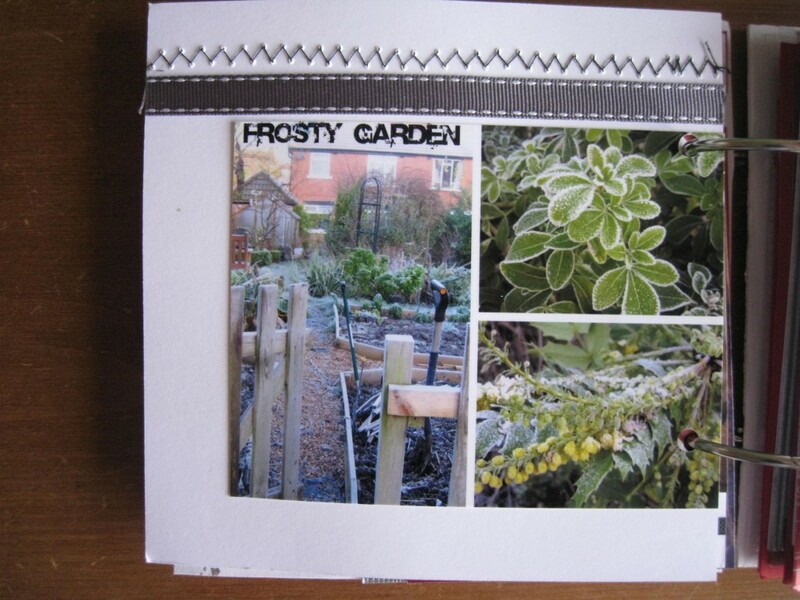 I have made entries about the temperature and included pictures of the weather in past years but usually only if it’s something special like a hard frost or snow. I should make a note of the weather generally and include reports for the newspaper. I always find looking back at everyday things like that immensley interesting. I included snippets of the wrapping paper I used 2009 and loved being able to look back at that detail. 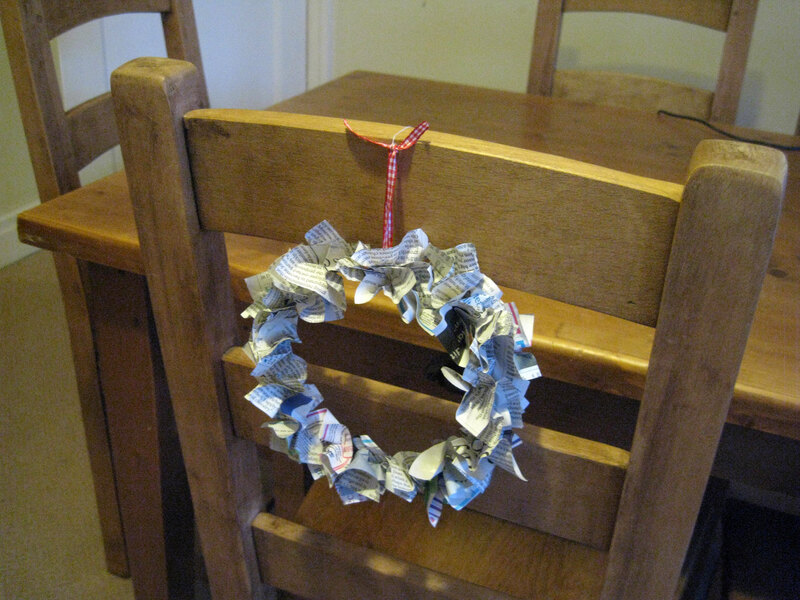 Must do that this year – hope to get some recycled rolls again. Adore this too but have only done it once or twice but it is one of my favourite looks. Clean and simple. We did the Christmas lunch last year and I got my niece to write out everyone’s starter choices. I added the list into the album. I know in years to come this will be wonderful to look back on. others are just good to remember like Fat Rascals for breakfast and coffee at Starbucks with my sister. While flipping through the three albums of Christmas’s past I noticed some things I didn’t like. 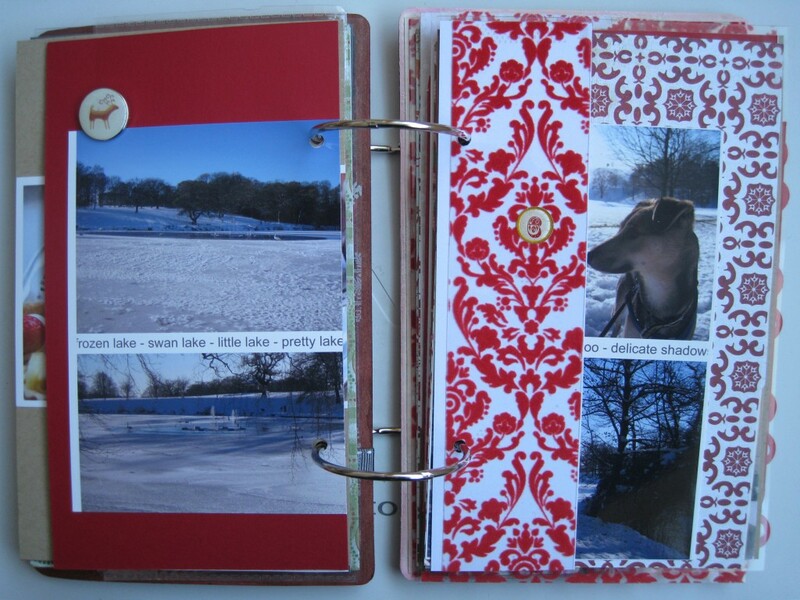 Not relating to the stories or the photographs but to the overall look of certain pages. But rather than be negative about this I just need to remember what I don’t like and avoid doing those things again. I know that most of the pages I’m not keen on are pages where I have taken the easiest route to getting the story told and in the book. And that’s okay. Whatever works for you is okay. It’s all glorious food for thought and will soon be put to use as the countdown to the start of December grow ever closer. Yay! 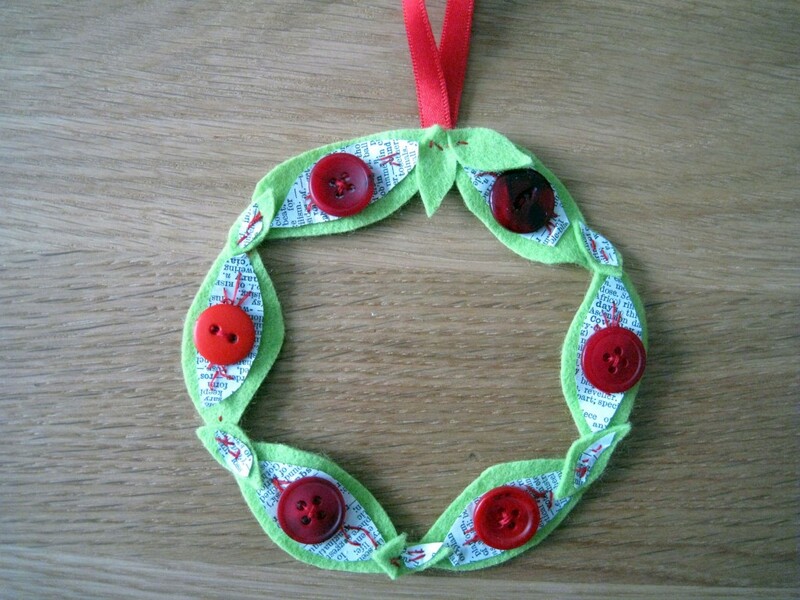 I was inspired to make this little felt wreath from a blog post by Donna Downey. I didn’t go for the machine stitching as I wasn’t sure my sewing machine could handle such a small area – okay I wasn’t sure I could stitch such a small area with the machine. Mine is quite small, about 4 inches long and 3 inches wide. I cut 6 felt leaf shapes and 6 more leaf shapes from old book pages the book pages shapes should be smaller than the felt. 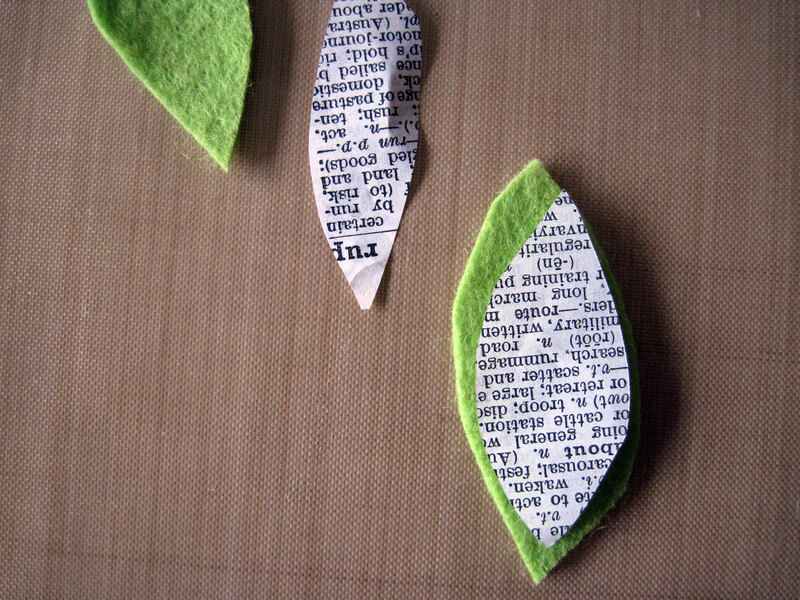 Hand sew the book pages onto the cut out felt leaf shapes. I was truly haphazard for this step getting the paper attached as quickly as possible. I knew some of the stitching would be covered by the buttons so I wasn’t too concerned about the random messy stitches. Anyway it adds to that homemade feel. 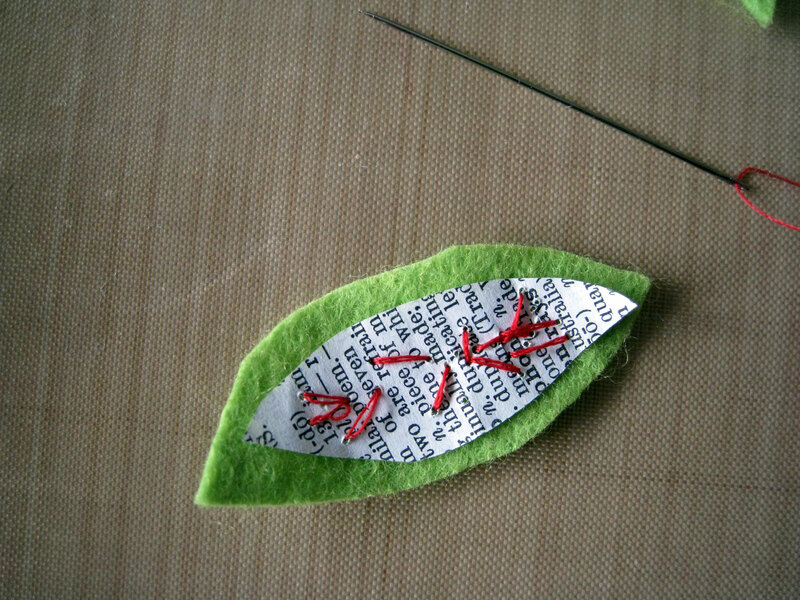 I then made five smaller leaves with teeny book page leaves sewn on top. 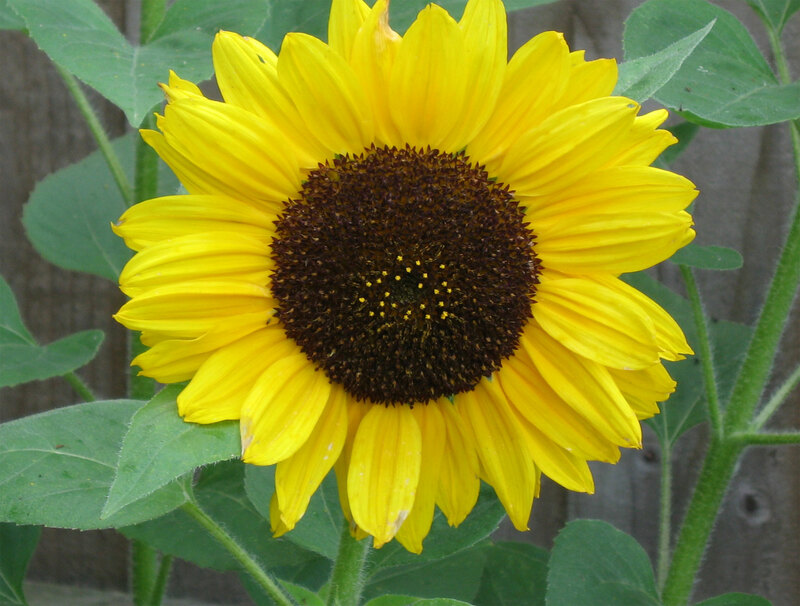 These then were attached to two of the larger leaves. I used two plain felt leaves at the top of the wreath to add a contrast and help hide where the ribbon was attached. 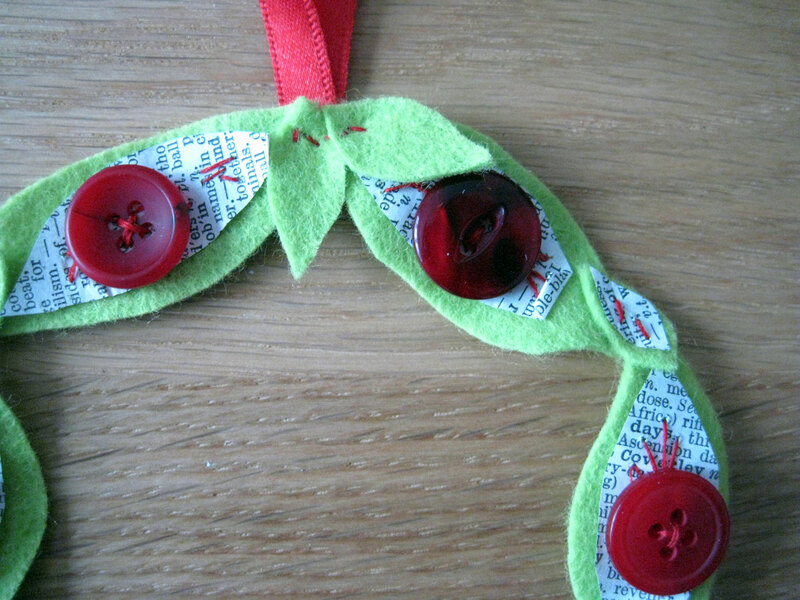 The final step was to sew red buttons onto each big leaf. Oh and I added thin wire to the back of the wreath, threading it through the backs of my stitches to help with stability. I may have to cover the back of the wreath as it’s very messy but overall I like it and although it took me a while to bring it together it was really easy. Back next week with number three. I have been inspired to write this list down. I read about it here. And thought why not do one of my own? It’s taken some brain wracking I can tell you but at last here are 75 things. I hope to add 25 more things so it can be 100 altogether. Do you have a list? Another new to me Agatha. And another to fill up the shelf. It was a little bit enjoyable and a little bit a labour of love to read. I wanted each tale to go on longer to be meatier to learn more about the characters but of course they didn’t and I think that was a shame. I’d love to know why she chose to write short stories rather than novels, if it was just that she had a great idea but it couldn’t be realised as a full blown novel. 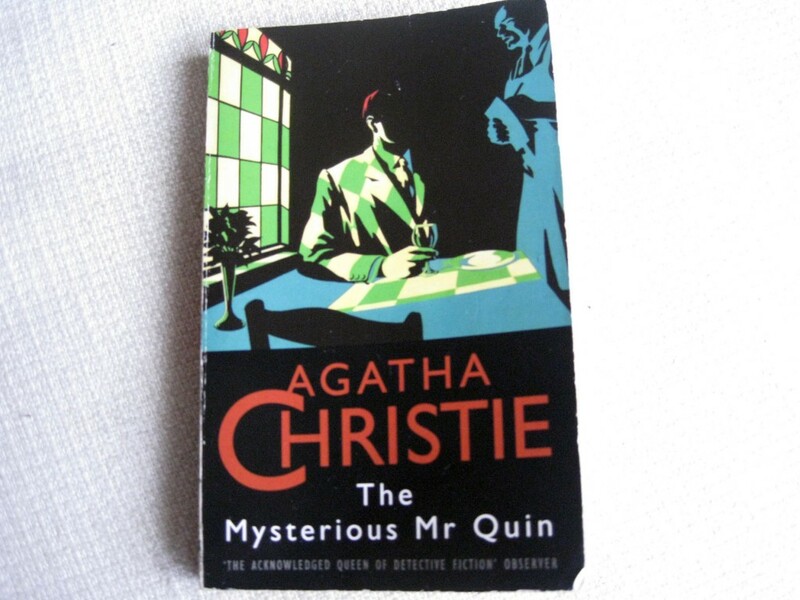 We will never know but as always I’m glad I read it and added the novel to my list of books this year and my Agatha collection. Only four to go. Woo hoo. I went to see an ex-colleague and now good friend in London. No photos of her because by the time I sorted myself out with the big camera it was dark. 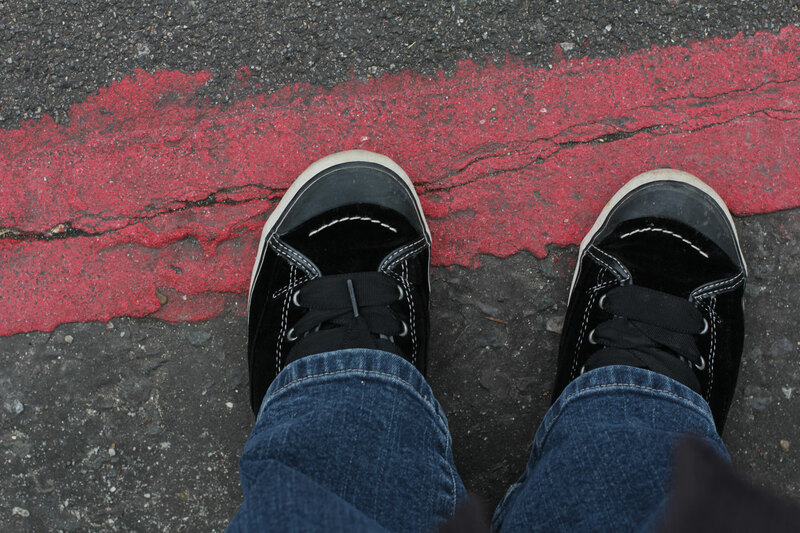 That’s my very comfy eco sneaks and the pretty pink congestion charge ‘yellow’ line. We had pizza for lunch and then spent the afternoon mooching around the Victoria and Albert Museum and saw this great exhibition. Then we went to see Wicked. Carrie picked the show so I didn’t really know what to expect. She had seen it before and loved it. I didn’t even know it took place in the Land of Oz. I loved it. I like a good musical any day of the week and this didn’t disapoint. Such a clever idea. In fact the more I think about it the more amazing I think it was. When can I go and see it again? Breakfast the following day was at Notes. I read about this lovely place on Shimelle’s blog. It was somewhere I wouldn’t have found so I’m glad she posted about it. 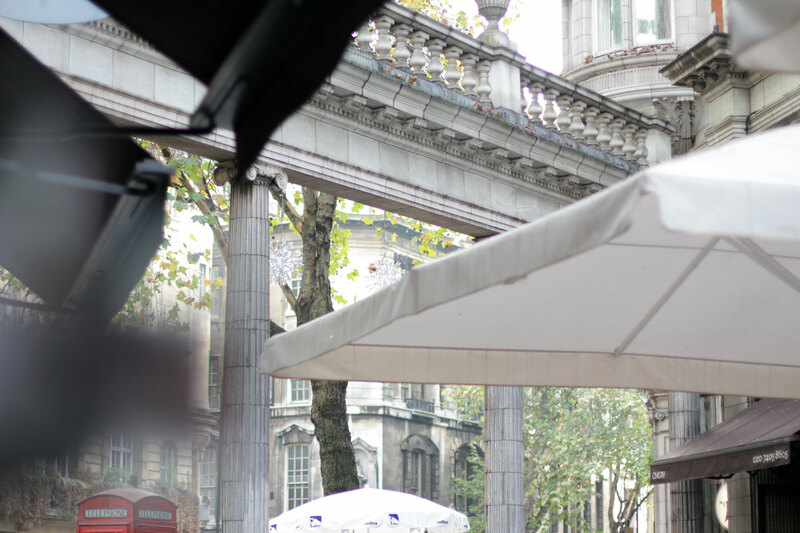 I took lots of photos as I meandered through Trafalgar Square and Covent Garden heading towards the British Museum. These beauties were just around the corner from my hotel. 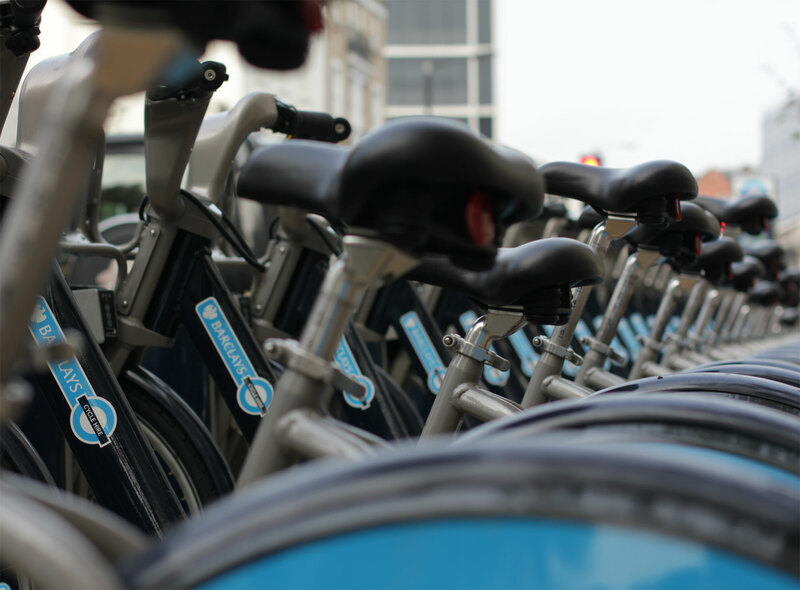 A new-ish thing to London is rent a bike stations like this one. Must be working as it was empty the day before. 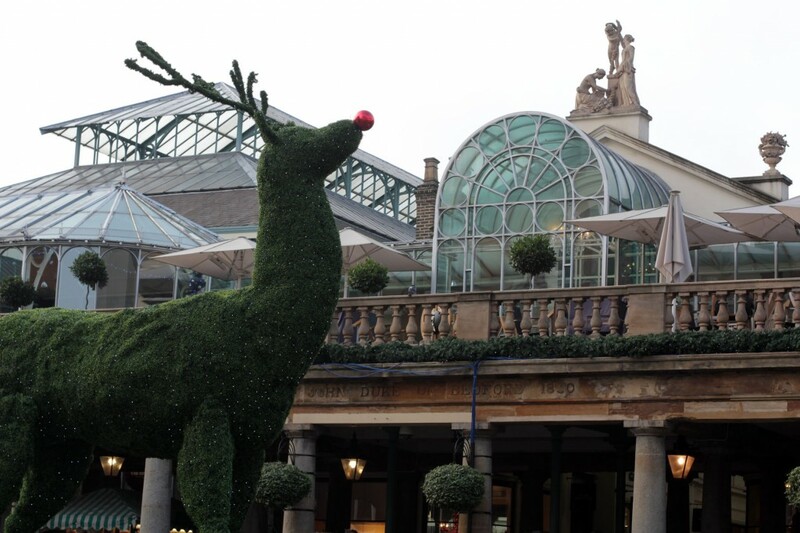 An enormous Reindeer standing in the square outside Covent Garden. 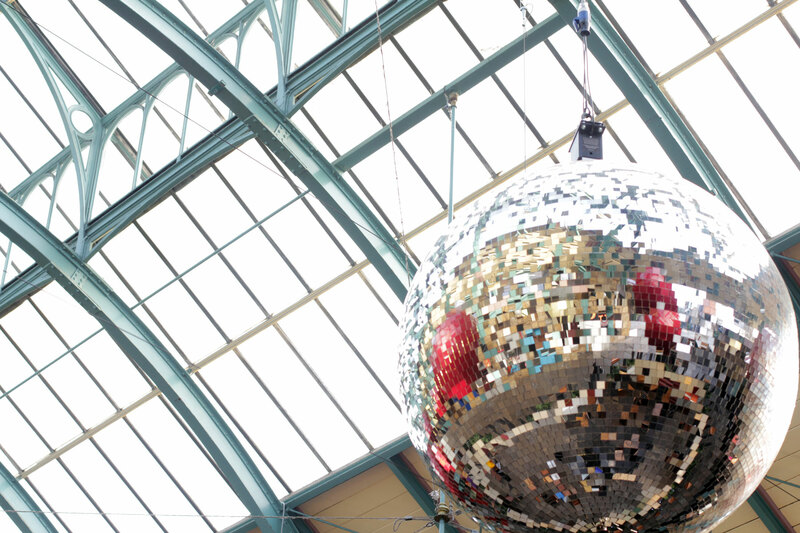 And glitter ball hanging inside the market place. I hoped to catch sight of myself in it but the angle must have been wrong. 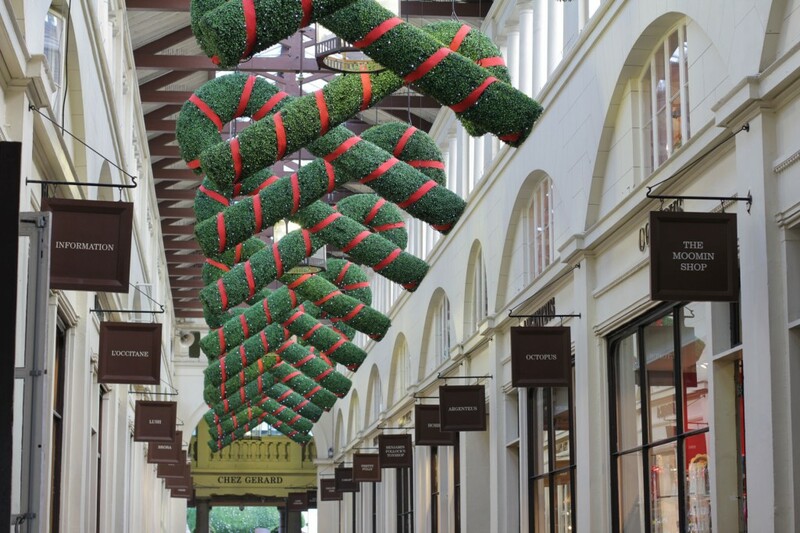 More pretty Christmas decorations in Covent Garden. I loved all the contrasts in this shot. 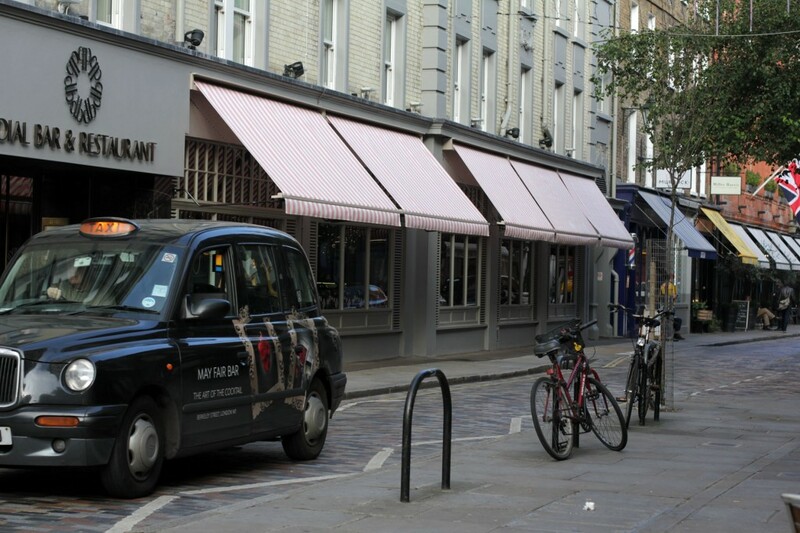 The red and white striped awning drew my attention at first but then the taxi drove slowly by and made it a great character shot of the city. 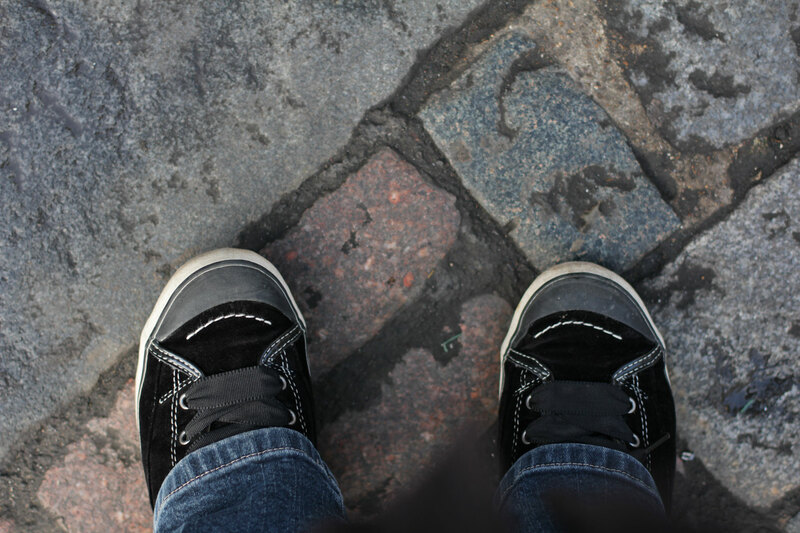 What struck me about the aimless meandering I did that day was that although I don’t spend my life dashing here and there, I never truly meander. The only deadline I had was to get to the train station by 1pm so I took advantage of nowhere to go. 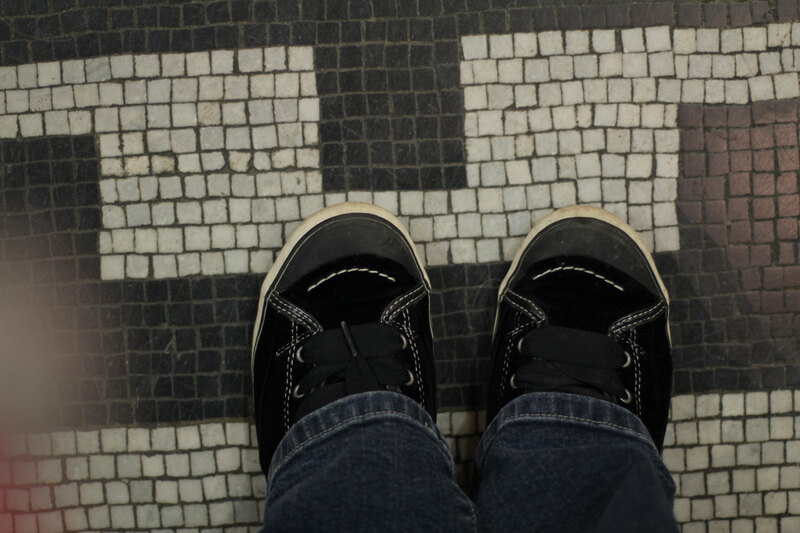 I saw things I’d never have noticed if I’d have been rushing and experienced a different pace of life. I know this isn’t a perfect picture but again I love the contrast and angles here. Between the stone and the parasol and the trees and the phone box. And because I had nowhere to go I caught photos I’d never have taken the time to stop snap before. 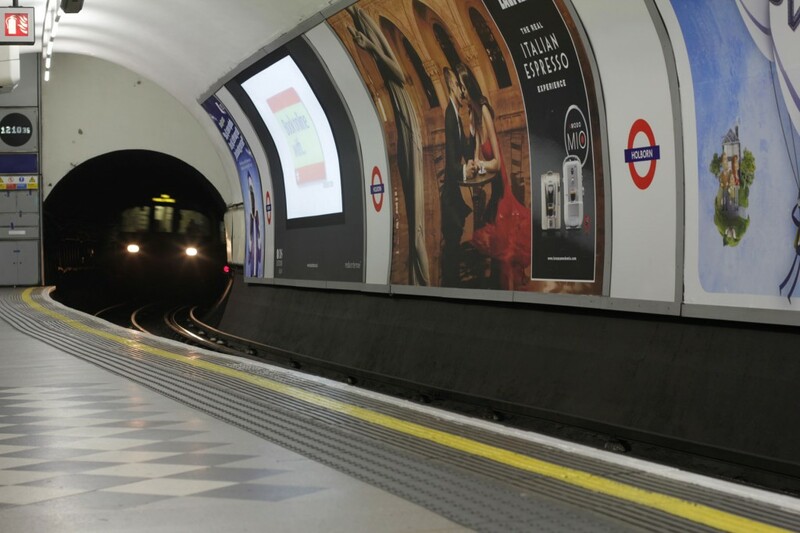 Like the tube approaching Holborn platform. It took me a couple of trains to work out the angle of the shot as I was resting the camera on the seat next to me. I sat there and watched two trains come in let the people off and depart. And I didn’t get on it. You know there was something wonderfully freeing about that simple act. Weird! A great couple of days in the capital. Now, Wicked tickets online here I come. A little recycled newspaper wreath. This is my first Christmassy project. I admit it’s not exactly like this one however I love it. Now that I’ve done one I think I will be bolder next time. Before I explain how I made it I must admit to a flaw in my personality or maybe it’s not a flaw, depends whether your glass is half full or half empty I suppose. 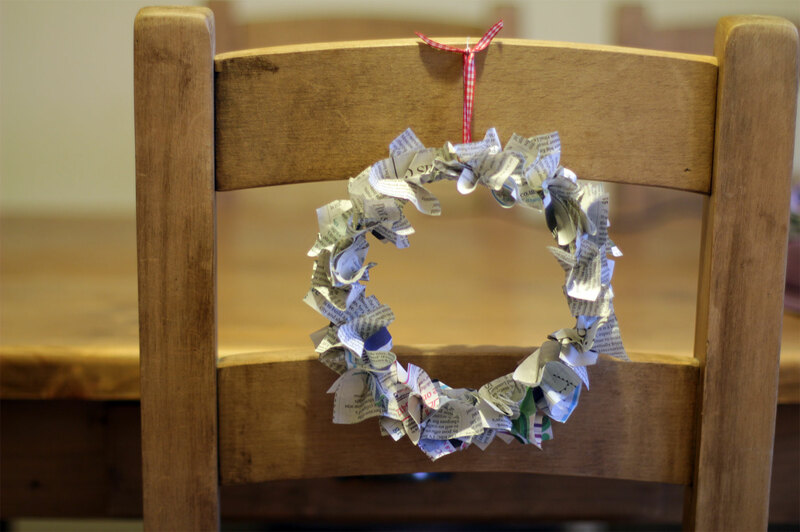 When I see beautiful things like the newspaper wreath either in magazines or on the web I think ‘that looks easy I could do that.’ And even though I have a wake of unfinished projects lying around my craft room I still think I can make more or less anything. So when I decided to make the wreath as project one I was surprised that I couldn’t come up with a method of how to do it – at first anyway. I had some lightweight wire that I formed into a circle shape and twisted another three lengths onto the first to make it stronger. Then I punched newspaper squares with a three inch punch. I folded the newspaper corner to corner then pinched in at the centre and glued the folds together. First I treid threading the newspaper onto cotton but it all bunched up towards the end of the thread and I couldn’t think of a way to fix it to the wire. Then I tried threading the paper onto another length of wire but it was too unstable and all the pieces sunk to the bottom. Then I thought of adhering two paper shapes together sandwiching the wire in between. And that worked. It took me about half an hour to construct after I had the breakthrough. I think a little bit of glitter might have to be sprinkled on, well what’s the festive season without glitter. I’ll be back next Monday with another project.